Scale: We offer our service to small groups as well as 100+ groups. Location: We prepare the food on a location, or we provide you with a deep space chiaroscuro experience on a fix location in the heart of Brussels, Belgium. The artist Frederik De Wilde and chef Dirk Gilis are proud to offer you an exquisite black dinner, powered by Witlov. During dinner De Wilde will talk about his crossover artistic praxis (15′). 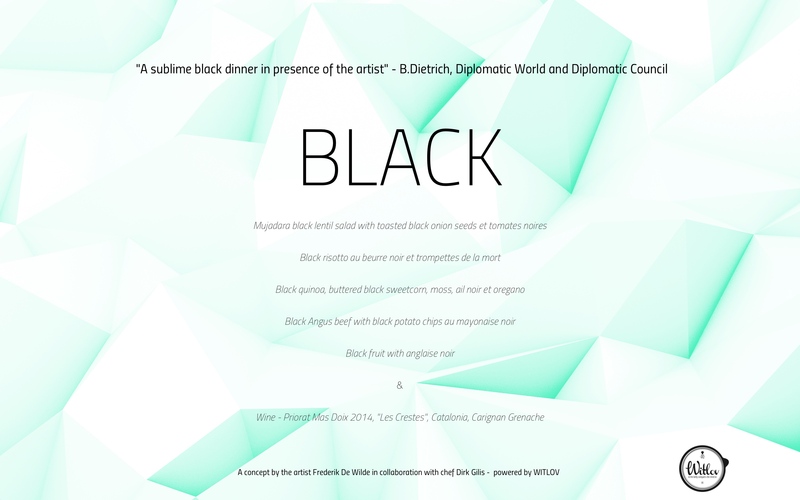 The artist Frederik De Wilde and chef Dirk Gilis are proud to offer you an exquisite black dinner, powered by Witlov. During dinner De Wilde will talk about his crossover artistic praxis (15′) and present his blacker-than-black art to the guests. The dinner space is true black and we expect our guests to be dressed in black too. Together we will make it an unforgettable void-a-licious event! We are constantly looking for fashion designers, scientists, performers, dancers, fashionista’s, storytellers, jewellery designers, … to join the blackest-black dinner guild. Please send us your idea or proposal for interventions during dinner.